No wheels on this car! 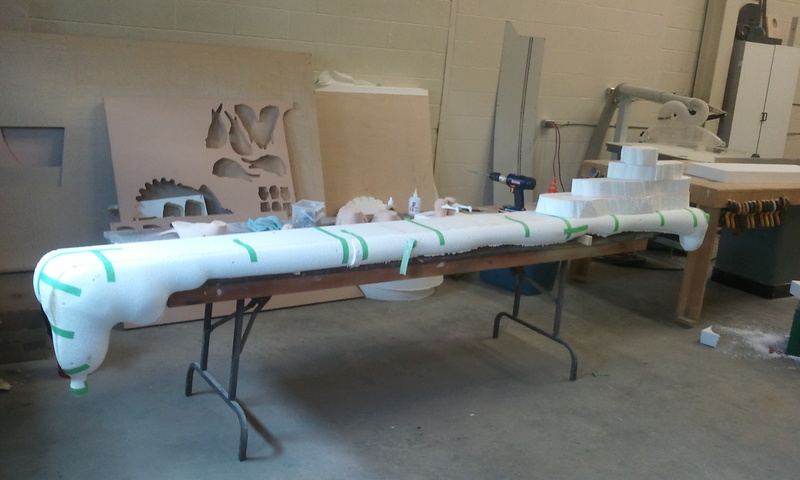 I worked most of the weekend getting the roller coaster car framework built. This was pretty simple as the work had already been done in the computer. I was supplied the size that the car needed to be already, and they would have spent a great deal of time on sizing it. 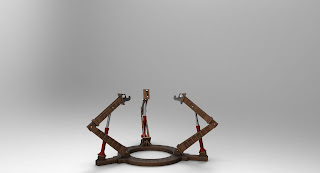 When I was modelling it, I just used the dimensions supplied. With the computer model ready, and signed off on, I was able to extract the pieces I wanted from the model, and convert them to usable cut files in Aspire. I find that Aspire, Corel Draw, and Hexagon work VERY well together for us. 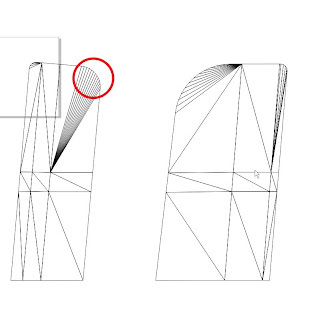 I saved the extracted geometry out for import into Corel, where I would get my usable vectors from. Once imported into Corel, this is what I had. 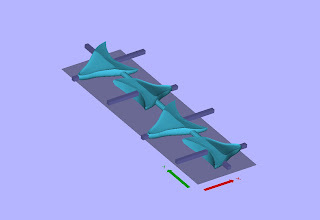 Notice that the corner rads are faceted. I could have pulled the curves from Hexagon, and imported them as AI files, but the faceting would still be there. So to get good clean vectors, I simply had to draw over the outline with new vectors. This allows me to get smooth rads on all the corners. And as the model was draw at real size in Hexagon, there is no worry that the sizing will be different. I made the model with the side panels being 2.25" thick. 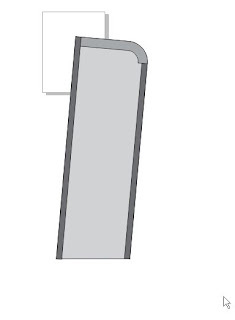 Using the vector file I created, I was able to offset the shape inwards to give me my top curved thickener piece. For the long flat runs, I cut 3/4" MDF into 1.5" strips. The curved pieces would get 2 layers of 3/4" making up the 1.5" to work with the strips. The skins were 3/8" MDF to be strong, yet lighter than solid MDF would be. The whole thing is going to come apart so it can flat pack into the van for delivery. The car parts are all built and have a coat of sealer on the raw edges. We got another last minute job today which should be fun. An oversized alien brain in a bell jar. This shoots on Thursday, the same day the roller coaster car shoots. Thankfully they are both shooting at the same studios, although its for something completely different. Well not the feet so much as I was happy to get them cut. 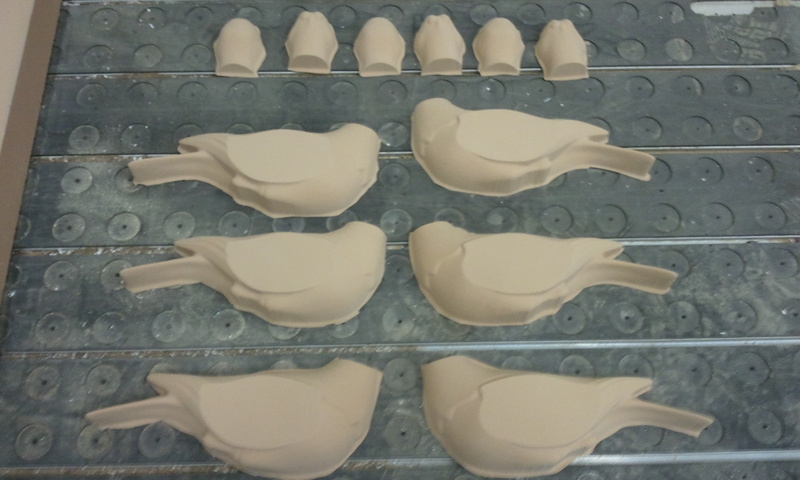 These are the feet for the seagulls. I exported them out from Hexagon and into Aspire. 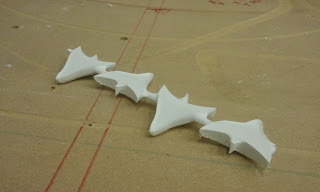 The toolpaths were assigned very quickly, and they cut almost as fast on our Techno cnc. These were cut from 3/4" pvc. I'll drill them out for the threaded rod legs. The rod will carry straight on through the styro-rock and bolt on from underneath. I don't really want these gulls flying the coop after they're installed. I'm trying to wrap up the odds and ends for our sign before the next two projects take over the whole shop. 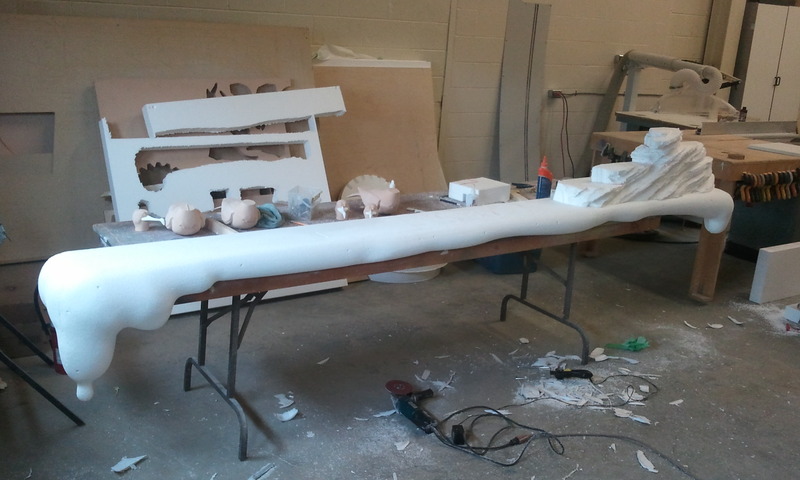 This included getting the styro-spray coating on the foam portion. I decided to brush it on, as I didn't want to deal with all the clean-up from spraying. I eventually got a total of 5 coats applied. I reallly like styro-spray, and I think it's a good product. Some people have had issues with it but I think that might be more a case of user error than the product. One important part is to make sure the whole piece is encapsulated. If it isn't, it will likely peel off after a while. Styro-spray is a urethane product, and all urethane's are first and foremost a glue. This is what they were developed for, and anything else is just a great secondary feature. With this in mind, the styrofoam becomes the weak link, no matter how strong the glue is, it's the styrofoam that will let go. If you encapsulate the project, it will perform exactly as promoted. I'm quite happy! This will sit aside for awhile to harden fully, while we work on the other projects. The other part of our signage is an oversized number 8. Our unit is #8, but there's no actual number on the back door, and this confuses some of the delivery trucks. I decided that a cool looking number sticking out from the building would certainly make us as easy to find at the back, as we will be in the front. The seagull stuff is happening at the front, so I want the 8 to match our website design. This was all drawn and textured in Aspire. I actually double sided machined it, so it will be cool from each side! It will stick out of the wall by 2 rusty hydraulic looking pistons. As the styro-spray coating can take awhile between coats, I set the Techno cnc at a slower pace, as I wasn't in a hurry for this number yet. We have another meeting in Toronto tomorrow, but I'll definitely be starting the coaster car over the weekend. This is gonna be a Roller Coaster ride! We received the approval for our newest build. This shoots fairly soon, so we will be full bore by the end of the week. It's a print ad shoot, so the camera angles are already determined, and how much we need to build has already been decided as well. 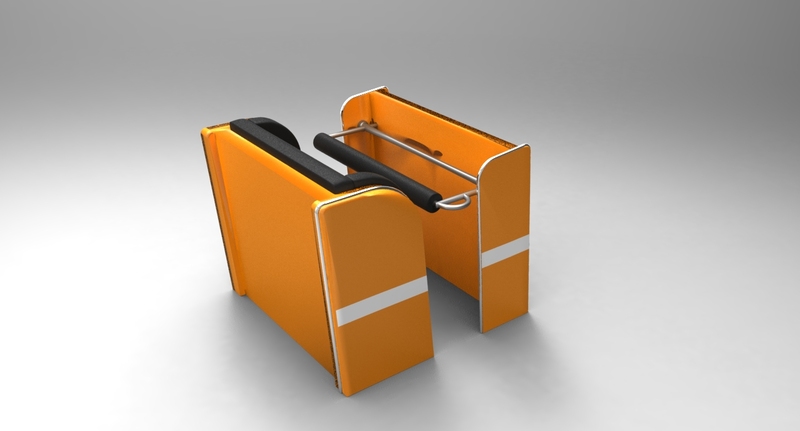 We will construct the first row seat of the front car of a roller coaster car. As well as a portion of a living room couch. Hey, I don't make this stuff up! I can't say too much, but I think it's for a huge new tv coming out. So I quickly rendered a mock up, based on the real-world dimensions supplied. The shot will be an over the shoulder view, fairly tight, so the floor of the car will never be seen. 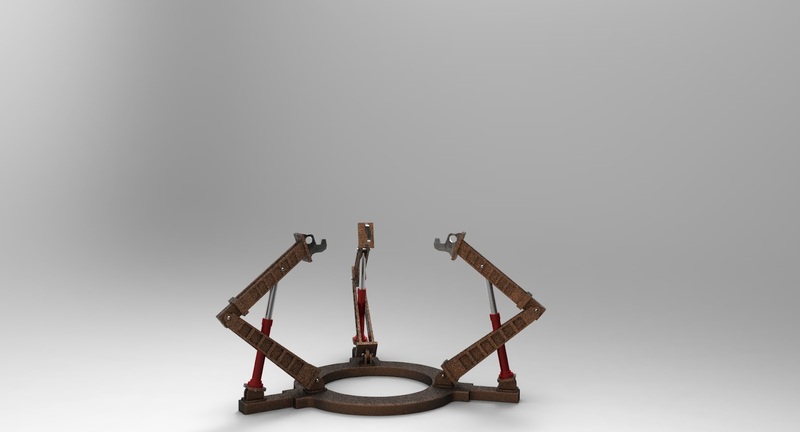 In fact, we won't even be building the seat, the people will be sitting on crates, or 'apple boxes' as they are refered to. We also had our meeting yesterday for the 'Time Travel" pod for an upcoming indie film. Can't say too much about that either, but their is some recognizable talent. I modeled up a quick render for the meeting of what the base of the pod may look like, based on some simple line drawings we received. Tomorrow, I will get the styrospray on our sign for out-front, and as it's kicking, I hope to get to the fabric store for some roller-coaster couch fabric. How many people get to say that. How many people might NOT want to say that! A short post tonight. I didn't get to the shop over the weekend, I was chained to the computer. Not a bad thing, although I do seem to get that burning in the shoulders after a while! 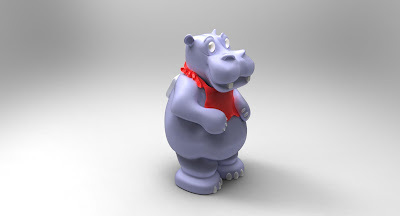 I photographed the little Hippo sculpture from the front, side and top. I brought these images into Hexagon, and set them up like blue-prints. 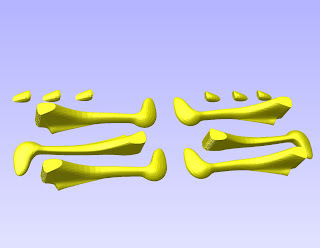 These are what I used to be able to model from. 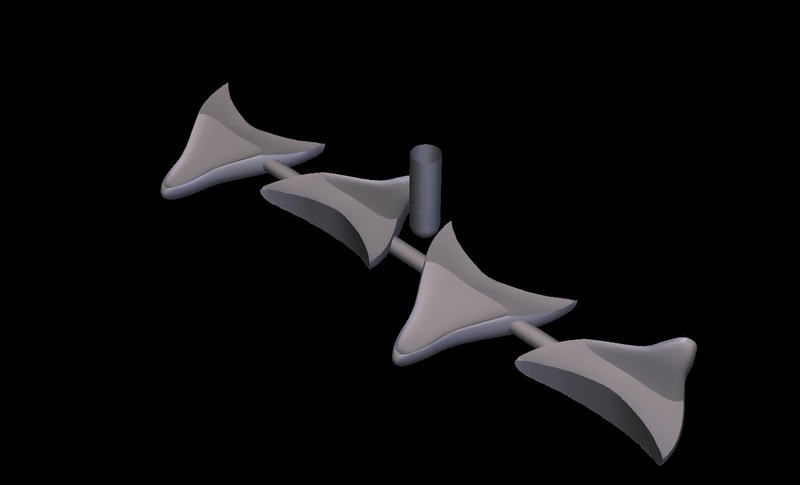 Some projects are quite easy to model for me, and I can whip them out pretty fast. The hippo took a lot longer than I would have liked, but I got him done eventually. By this morning, he was all built, and a final render was sent to the client. I think they love it. 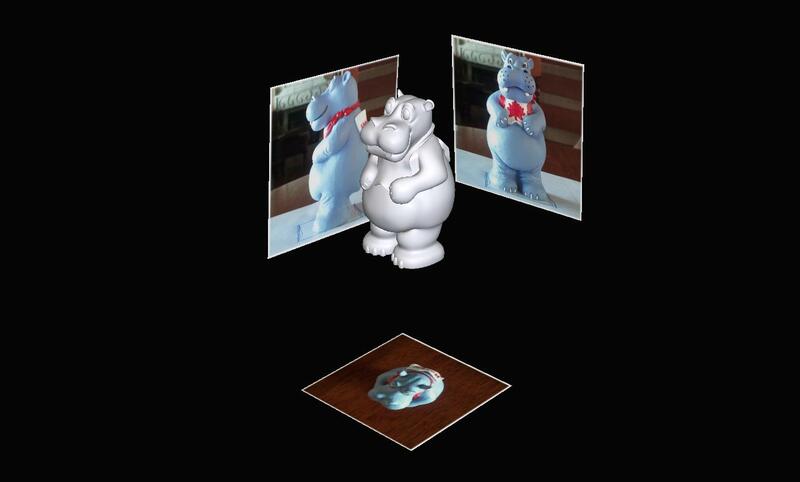 This Hippo is going to get 3D machined on a 4th axis router at around 36" high. We haven't been asked to cut him, but I keep kinda hoping. The nice thing about 3d modeling him, versus a laser scan, is that our version wont have any mold seams, or any other tooling marks that would be captured by the scan. And there are some spots, like under the chin, that I'm not sure the laser scanner would have picked up. Plus, the mesh would be pretty coarse, as the scanned original was only 3" tall. This could be a potential problem if they scale him to a possible 6' later. I did a basic render of him that I sent to the client. I didn't need to spend the extra time on texture mapping his eyes, or bib, so I just assigned a basic colour to these spots. All in all, I'm pretty happy with him. Tomorrow is looking like it will be a blast. We have a production meeting for a time machine pod/ capsule. I've taken the time to quickly model and render the hydraulic stand, based on the early concept sketches, for the pod. Hopefully it's in line with what they want to see. I'll keep you posted. And if they decide to go in a different direction, I'll build it any way, and keep going back in time until they agree! Pop ins are always welcome! Today seemed to become "pop-in" day at the shop. This was a nice change for me. One of the visitors was a friend I met through doing some design work awhile ago. Bryan owns Tools Wood in Thunder Bay, and as he was in Toronto, he decided to swing up with Nick from General Tools. It was a very nice visit, that's for sure. Between visits though, I got some work done on our theme sign. 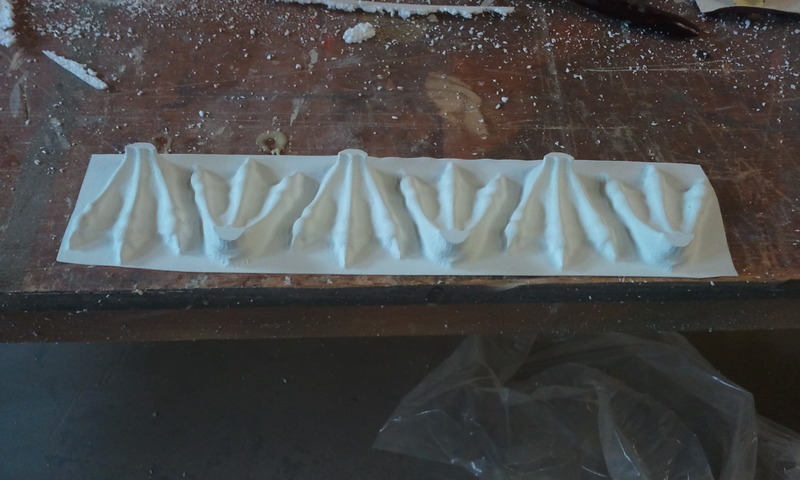 The styrofoam water got its final shape and sanding, and I started on one of the rocks. 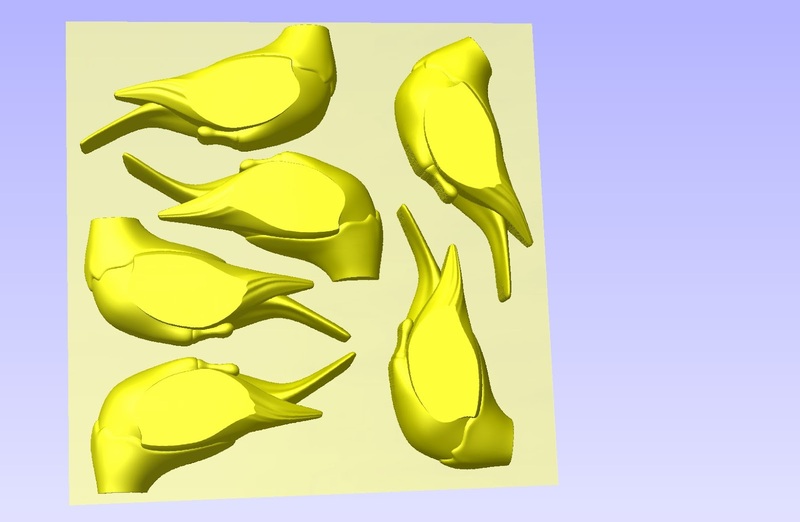 I also was able to machine the lower beaks for all 4 seagulls. Usually when I 3d model in Hexagon, I build the pieces and stick them where they need to go. Hexagon has no collision detection, which means shapes can pass freely through each other like ghosts. 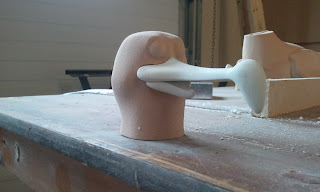 So in order for the lower beak to fit perfectly, I have to boolean the beak out. 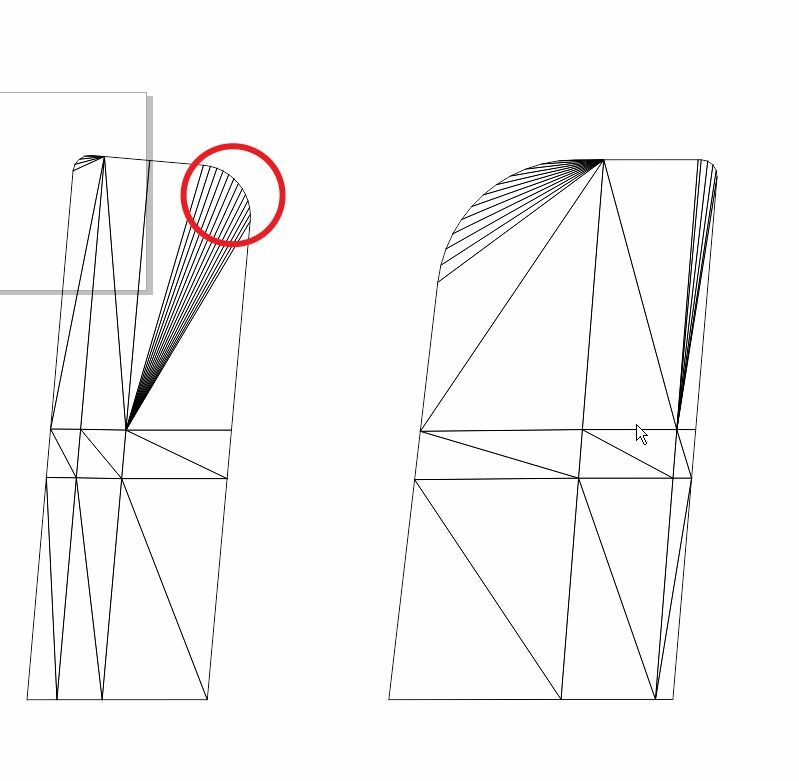 Basically this trims the geometry out by the piece that overlaps it, just like a vector trim option in Corel Draw, but in 3d. 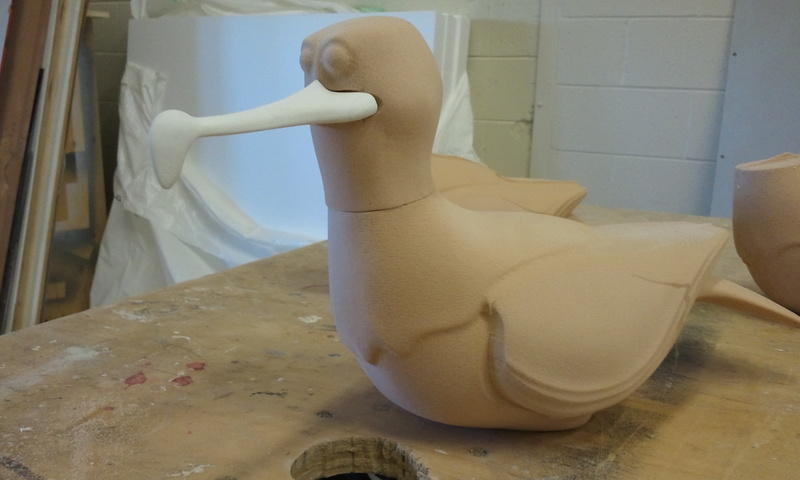 Long story short: I used the top beak, and neck of the seagull to trim the lower beak to fit exactly. 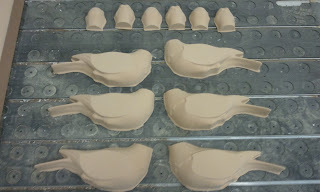 As the lower beak is a small piece already, I didn't want to slice each one and glue them together. This means Cut 3D. I really dig this piece of software. I could do it in Aspire, but Cut 3D makes it so automated, it's sick! I did pre set-up the file in Hexagon though. I laid all four parts out on the exact same plane, then added a tube down the middle of them all that will act as a tab to help hold them together during machining. Notice that the tube doesn't stick out at the ends. Otherwise Cut3D would think it was part of the model, and want to cut around it, making it difficult to machine. 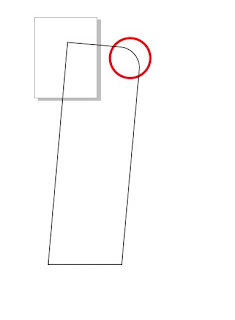 I find it also helps to quickly draw a cutter the equivalent of what I will actually be using. In this case, a 1/4" ball-nose. This helps insure that the pieces are spaced apart enough to allow for full cutter travel around all the parts. If they weren't spaced apart enough, I would have to re-open Hexagon and adjust the parts, then re-import into Cut 3D. 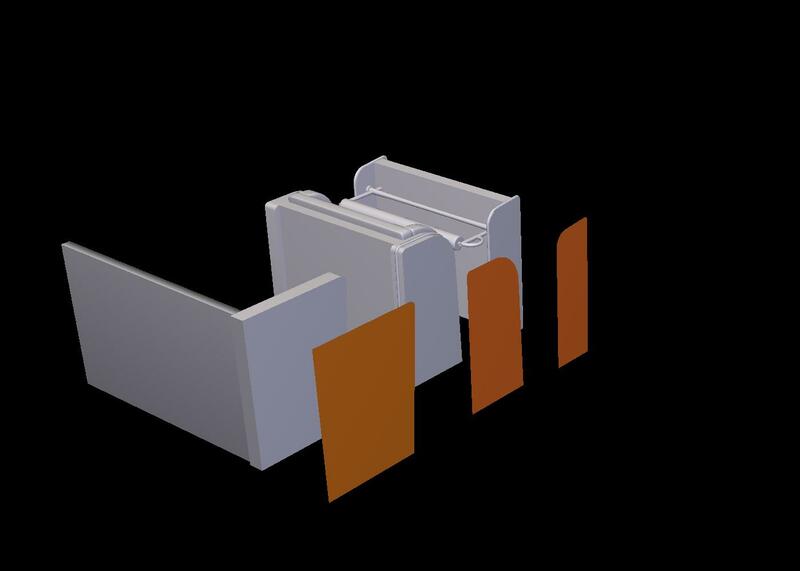 The rest of the tabs were interactively added in cut 3d, and very quickly I might add! They came out quite well I think. 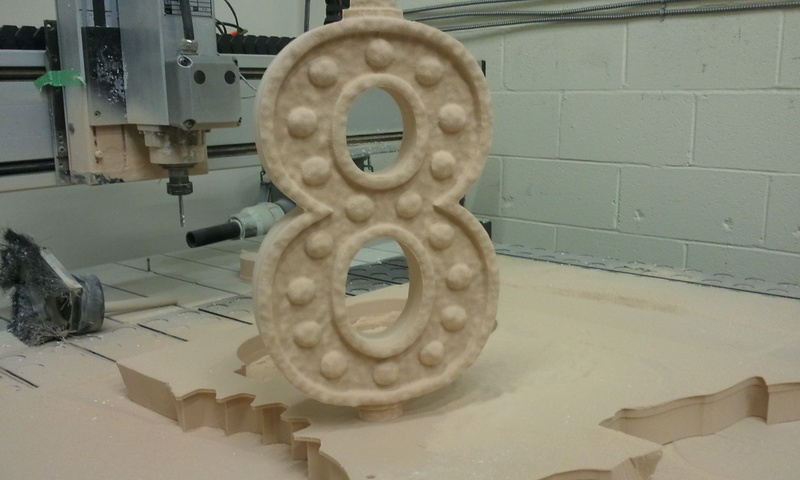 Our Techno cnc made short work of the material. 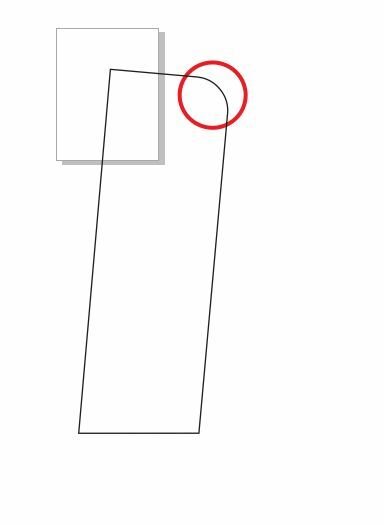 I probably could have done other things while it cut, but I find it mesmerizing to watch it work it's magic. And on top of that, they fit like a well designed model kit! I probably won't be able to get to work on this over the weekend, as I have a cartoon hippo to model for a client. The good news is that the hippo already exists, and we have him already, but he's only 3" tall. I am going to photograph him from different angles, and model from the images in Hexagon. Today I started to get to work on the water for the new sign. The water slab will reside on the top of the existing sign box. 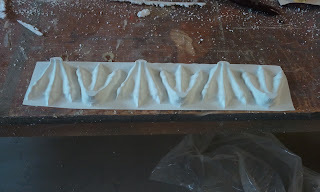 This I'm doing from type2 EPS foam. I will hardcoat it with styrospray when it gets its final shape. I was going to sculpt it by hand, as styrofoam carves pretty easy, but the one thing I dislike most about styrofoam is the mess. It gets in your shoes, in every fold of clothing, your pockets, etc. 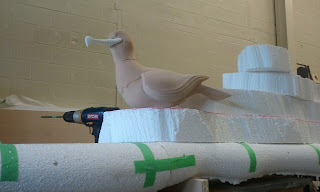 We carved a huge mountain a few years ago out of foam, and it was everywhere, for a very long time. It even found it's way to the house. I decided that I would use the router to shape this. The dust collection on our Techno is pretty good, and I could do something else while it was working. The good thing about using our Techno cnc to shape this, is that it will be exactly as I drew it in the computer. There isn't alot of room on the sign box, and I didn't want to run the risk of the dimensional water impeding on the text portion of the sign. With the outline laid out, I can be sure that nothing will be in the way of the lettering. The next step was to quickly mass it out in Aspire. I have a few sheets of 3" styro left over from the shark job, so this was immediately enlisted. 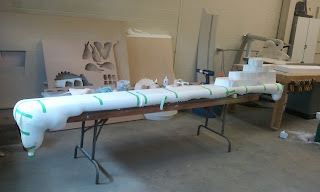 I had the sheets cut to 4'X4' at the supplier, so the parts will be done in 3 sections, as the sign is 10' long. In Aspire, I used the create shape tool set to a 90 degree dome for this. I did remember to add 3" to the length of each piece, then radius-ed the corners to be sure that Aspire wouldn't taper the shape down at the join lines. After the shapes were created, I just trimmed the component to the right length. This assures me that the shapes will blend fairly smoothly between each section. I'm not at all concerned that some of the sections look a little wacky at the moment, as I will be blending them after the glue dries. The top surface of the water was 3 slabs of the same styrofoam. I did rabbet in 2 channels for 3/4" plywood. 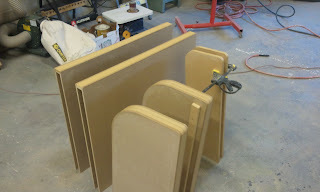 The ply was cut to a width of 2" and glued into the rabbet on it's edge. 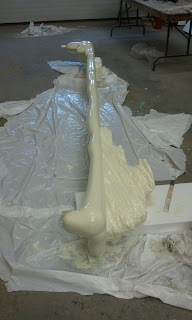 I also drove long screws in from the edge, trapping the plywood and urethane glue. This serves 2 purposes. 1 was to add strength to the slabs, and 2 was to allow it to become a screwing strip to the top of the aluminum sign box. I also quickly massed up one of the rock sections. This I will sculpt by hand. There's not alot of depth at the top of the sign. The building we are in has block walls that run about 4" past the top of the sign box, then it becomes corrugated steel siding, which sits proud of the blocks by 2". This reduces our depth where the rocks live, so they're getting a little shallow. I will have to work very closely with the seagulls when I start shaping the rock, just to be sure everything works. So far so good! This has been alot of fun so far! It's pretty cool to be able to work on neat stuff most of the time. Even if it is for us! I had 2 meetings today, one first thing in the morning, and one this afternoon. This left the day in-between to do a little work on our seagulls. I got the bodies and heads glued together, as well as the last slice of the wing cut and fastened on. 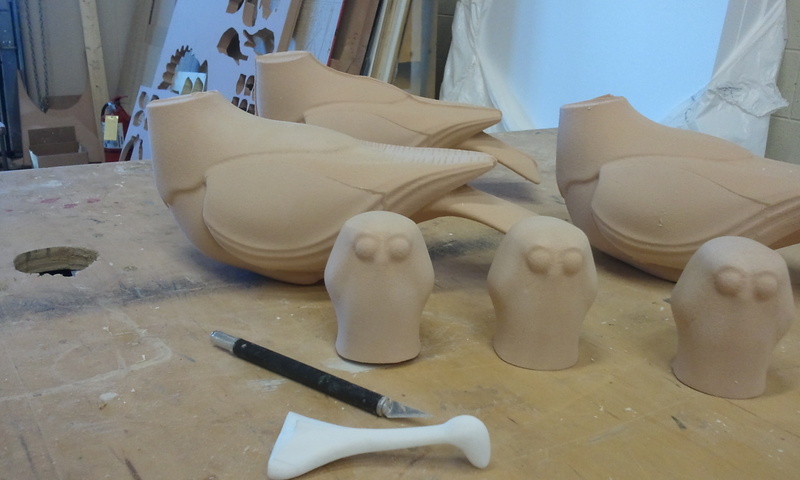 While these were setting up, I was able to toolpath the top portion of all 3 beaks. I havent posed the 4th seagull, so I haven't addressed him at all yet. 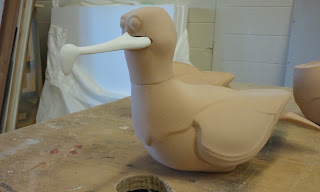 I could have applied 1 more level of smoothing to the beaks in Hexagon, but I figured that the whole beak would get sanded down because of the joints anyway, so I didn't sweat it too much. I sliced the beak for our 3/4 inch PVC sheet in Aspire, and the pieces lined up perfectly! I quickly test fit the beak, and I'm quite happy with it. 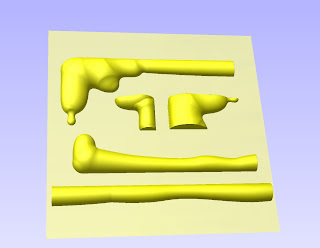 I've been cnc'ing models for 6 years now, and I always get amazed when the real thing looks exactly like the computer model. I know, I'm a geek! Most of our computer-only jobs are coming to a close (although we are still quoting on new ones) This left today open to get into the shop and start creating again. A few of these projects are for ourselves. There is no signage on our unit, and I want something fun and unique. I spent the last little while thinking about what I wanted. As we are not located in the film district in the city, it would be pointless to advertise 'Film Props' on our new signage. We will still cater very heavily to the entertainment industry, but up here in our town, I will push our themed signage. I decided that the 20"X120" sign box would house a sign for our themed signage, with our company name being displayed on the office windows instead. After spending a bit of time on the theme for the design, I chose a water-y style version. We are very lucky to be in a town that is nestled along the shores of a small lake, and one of the things that there is no shortage of are seagulls! 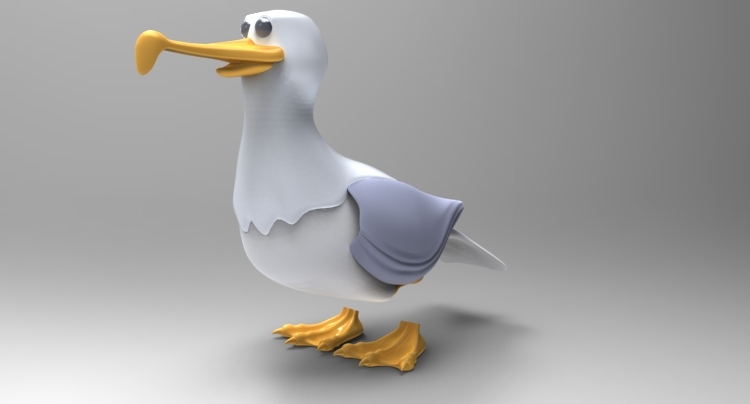 I had modeled a seagull before for a display, but that character is copyrighted, so it would be pretty shady to use him. I spent a little bit of time on Sunday to remodel a new "Oxenham" version for us. As with the last seagull, there's no need to model the legs, as they'll be threaded rod as a fastening system. I cut the head off him, and brought the body into Aspire. The head removal was necessary for 2 reasons. One was to change the rotation angle so they weren't all in the same pose, and the other reason was so I could machine the face portion of the head straight on. The bodies and head only took about an hour to rough and finish machine on our Techno cnc. I'm not going to give away the final design on this sign, as I hope it will be a bit of a surprise to everyone reading, but I will show you the preliminary layout for the text portion. The text is going to be laminated sintra letters on a sintra back panel. It's certainly going to lend itself to the 'by the lake' feel that I wanted. Still kickin in Port Perry! I though I would post to let everyone know who has contacted me that I'm still alive! The last couple of weeks have been very stressful around here! I have been doing nothing but computer modelling and photo-realistic rendering for a few clients. This has been a new avenue for us. When I started 3D modelling, I never would have guessed that I would be rendering displays and kiosks as a viable income. I though I would just be increasing my skillset for our work! I wish I could post some of this stuff, as I'm quite proud of the results we have been getting. But due to the fact that our renders will be a small part of larger proposals, it would be wrong of me to post these to the internet. The other part of our stress has been moving. We have actually moved the entire shop a second time. Without getting into the freaky details, the other place was just not getting separated on any sort of reliable schedule, and this meant turning down a boatload of work, due to unavailable space and power requirements. I hated that part, but we had no other option. I am proud to say that we have now taken possession of a great space. 22' ceilings, a 15' X22' mezzanine as well as a brand new finished office space that looks fantastic. And as the space was completely gutted when we signed the lease, I was able to choose the flooring and everything. This was such a great experience, especially coming fresh out of the last "learning experience" we just had! I gotta tell you, as much as I love my Techno cnc, I don't love trying to move it......twice. I am very blessed to have had all the people that showed up to lend a hand. Everyone was awesome and we got everything moved in 2 hours. I couldn't have asked for better friends and colleges. There is still lots to do though. Finding a home for everything will take some time, but I have been working evenings at the new space, getting things set-up. I am sneaking in some time now and then to come up with a 3d sign for the front of the unit we're in, as well as design some furniture for the office. I am really hoping to get started building something physical, as I fear I may be gaining a 'spare tire' from sitting at the computer all day.